I was 23 years old and a couple of years out of college in 1967 and I had a yearning to visit the “old country” and see a bit more of the world beyond my growing up in California. I applied to and was accepted into the International Division of Waseda University in Tokyo. Waseda University is one of a small circle of prestigious private universities in Japan; it is sometimes referred to as the “Stanford of Japan.” For nearly 50 years, Waseda instituted a “Kokusaibu” or an “International Division” to which students from other countries (like me) could attend special classes taught in English or could take regular courses in Japanese based on language proficiency. The program utilized the Waseda faculty and other invited lecturers and taught courses about Japanese culture, history, and art. But the experience was far more that simply lectures and books but an immersion experience into the very fabric of the Japanese society. I was part of a group of about 20 students from California and this was my first trip to Japan; I was impacted in ways that changed my life forever. After landing at Haneda Airport, I marveled that people who looked like me were actually running the airport and I realized for the first time that I had a subconscious (and racist) assumption that only white people were capable of such things! My eyes became open to so many realizations as I experienced the good and the bad of this small island country teeming with people eager to move their society forward only 22 years after the end of the World War. Because I looked Japanese, I quickly learned to let people know I am a gaijin (foreigner) so they would understand any cultural or language errors I might make and be more forgiving and patient (which they always were). Waseda is in the heart of Tokyo and my home-stay was in the countryside so I commuted on the express or semi-express train (about 40 minutes) every day. No matter how crowded the trains were, no matter how nasty the station toilets were, no matter how polluted the Tokyo air, it was an exciting adventure for me and I loved every minute of it. I learned much from the classes I took but so much more from the times we American students explored the city and the surrounding environs. My friends and I went plum blossom-viewing and cherry blossom viewing and of course carousing with other students in Shinjuku. I nearly gave myself a heart attack when I went to a public bathhouse for the first time and I wanted to blend in and look like a “regular” and so after lathering myself off, I nonchalantly went to soak and stepped into the extra-hot section of the tub (no wonder it was empty)! My heart was beating so fast it felt like it would burst, so I erupted out of the tub like a Poseidon missile and of course, everyone in the bathhouse immediately surmised that I didn’t have a clue to what I was doing! My desire to look “cool” almost killed me! 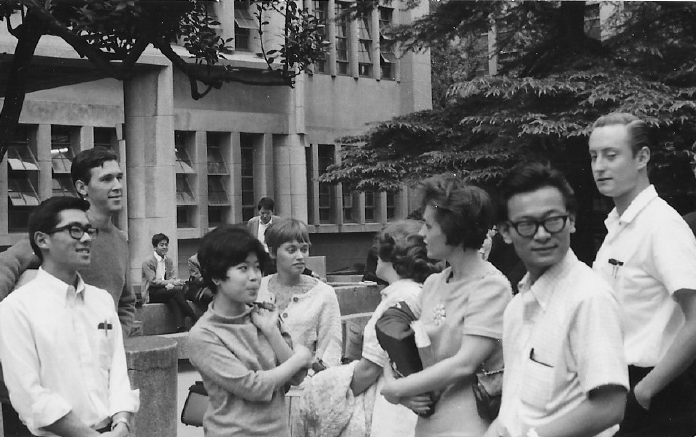 Some members of the Kokusaibu group on the Waseda campus in September 1967. 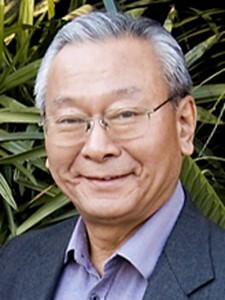 Bill Watanabe is second from right. Others in the photo came from places such as Hawaii, St. Louis, Yuba City, and Los Angeles. I also improved my elementary and rather poor Japanese and was very excited when I visited some relatives in Fukushima and could communicate with them in Japanese. I had never met these relatives and so I soaked in all the stories my uncles and aunts told me about my parents and my family history. The fact was not lost on me that I was sleeping in the same homes my parents grew up in as well as their parents before them — the sense of my heritage and cultural roots swept over me as I looked at the ceiling with century-old timbers covered in cobwebs. My relatives were rice farmers and they treated me to some freshly threshed rice and it was (and still is) the tastiest rice I have ever eaten! Campus life at Waseda was great — with an occasional student demonstration by the Zengakuren, who would, by the hundreds, form serpentine columns and double-time around shouting political slogans with loudspeakers and banners. It’s funny but I don’t remember what they were demonstrating about! I was told that the beautiful actress Sayuri Yoshinaga was a Waseda student, so every day I would keep an eye out for her, hoping to see her walking across campus and maybe even catching her attention (after all, I was still young and could dream). It has been almost 50 years since those days, but the memories still linger in my mind, almost as fresh as the days I lived them. Some of us who are alumni of the Waseda Kokusaibu experience are getting together on Saturday, Oct. 10, from 12 to 3 p.m. at the Japanese American Cultural Community Center (JACCC) in Little Tokyo. If you are interested in attending, please email me ([email protected]) and I can provide further details. The Waseda Kokusaibu has been phased out, but the great memories and experiences continue on in the lives of the hundreds of Kokusaibu alumni. Even though I never got to meet Sayuri Yoshinaga, which is a little disappointing, nevertheless I did get to have one of the greatest years of my life — and that’s not too shabby!